I am a true fondue lover! Every Valentine’s day, my hubby’s family gets together and does a huge fondue party. They are the best and have pretty much any kind of fondue out there… oil for steaks and chicken, cheese, and my favorite… CHOCOLATE! Oh goodness, I could dip pretty much anything in chocolate and it would make it that much more delicious! I attended a blog conference in April where I was first introduced to Velata. 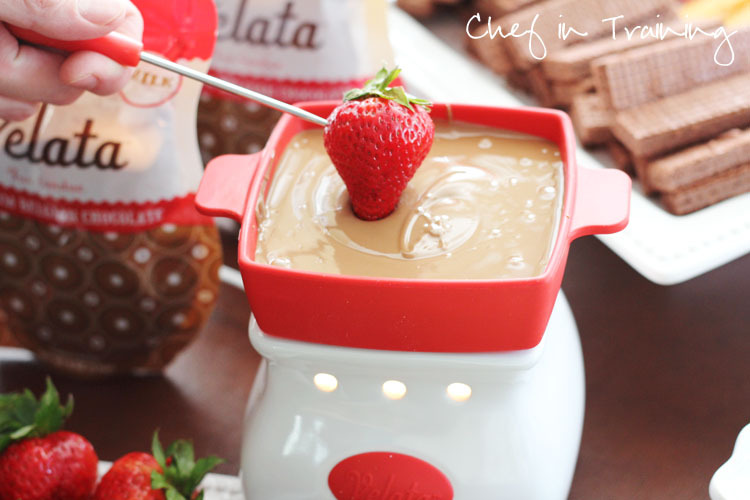 Velata is seriously pure genius and makes fondue SO SIMPLE! No more candles or special things to heat your fondue… Nope! Velata uses a LIGHTBULB- making it safer, easier and just downright simple. Simply plug it in, turn the switch to the warming setting you want, and WAHLA! Ready to go! 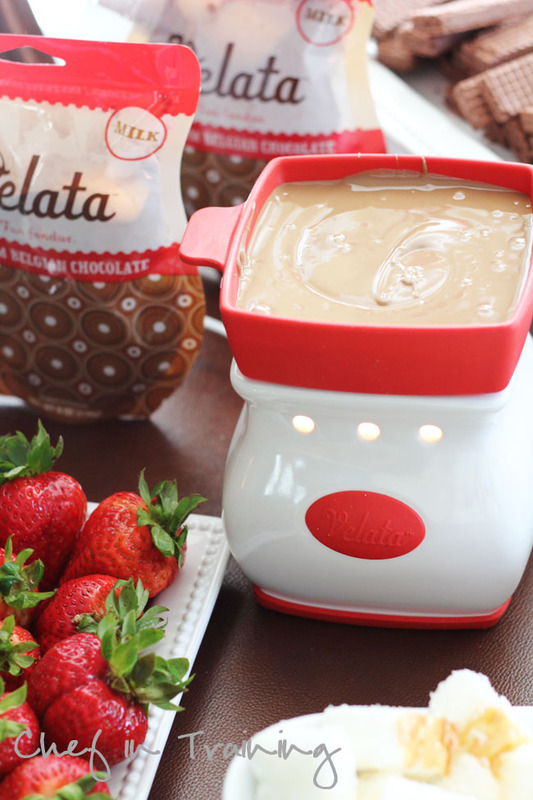 Velata has a variety of flavors of chocolate for dipping (Caramel Milk being my personal fav :) ) all delicious, pure and smooth chocolate- just the way you want it to be! One of the best things about Velata, is that the top piece that holds the chocolate is dishwasher safe! Thats right… just pop off the rubber top, rinse it out and put it in the dishwasher! AMAZING right?! I was given a Velata warmer and some chocolates to try out and review. I brought them for the dessert at our Father’s Day party and they were probably the highlight of the menu! My whole family had fun dipping away and talking. Fondue is such a great idea for a crowd because it helps get people talking and good conversation started as everyone is gathered round. I absolutely LOVE my Velata Warmer and chocolates! It is truly a wonderful product and I know it would be a hit at your next party, too! one Velata Warmer and 2 bags of Velata Chocolate of their very own! oooh i looooove fondue. this would be so perfect for me to have for my housewarming party this summer! My favorite thing to dip chocolate in is Peanut Butter! I love strawberries dipped in chocolate... but I've never tried a real fondue! Awesome! I had a fondue pot years ago and it was such a pain that i got rid of it. This looks so much better! Oh and my favorite thing to dip in chocolate is strawberries! I love dipping berries, poundcake, and chocolate chip cookies in chocolate! What a great idea! Alot easier than a chocolate fountian. My fav thing to dip is fresh fruit! Any kind of fruit is great in chocolate! I absolutely love fondue and am so glad you highlighted this product. This will be a perfect way to introduce my kids to my favorite treat! I love fondue!! Our family calls it a Fondue Festival! And my fav thing to dip is crusty bread in the cheese!! Vanilla Cheesecake Bites Are Best Dipped in Dark Chocolate!!! This sounds wonderful. I do Coldstone ice cream sundae parties and this would be a wonderful addition! Everything tastes better with chocolate. I love dipping strawberries in chocolate! I love to dip bananas in chocolate!! Fondue is so much fun. I remember being little and my mom fixing steak fondue for me and my brother and sister. I would love to win this! Definitely love to dip strawberries in chocolate! Fav thing to dip in chocolate? May sound weird but, plain Pringles! I love dipping bananas in chocolate. How cool is this! I wouldI've to have fondue at home! Thanks for sharing another great find! I love to dip anything in chocolate, but my favorite is probably just simple pretzels! I love there is something like this out there! I love dipping Strawberries or any type of fruit. I still feel like I ate healthy!! Ooo I love to dip bananas and pound cake in chocolate! I just made chocolate fondue for my hubby to celebrate Father's Day. YUM! I love to dip berries, peanut butter, and pound cake into chocolate! This would be so much fun to have for parties! This looks wonderful... I love fruit dipped in chocolate... has to be healthy, isn't it? My favorite thing to dip into chocolate is strawberries! But I also love small bite size pieces of rice krispy treats. I love to dip brownies and pound cake in chocolate, mmmmm! Fondue is fun! I love dipping strawberries the best. Pretzels dipped in chocolate!! Yummy! I love to dip special cheese from my husband's island Sao Jorge (part of the Azores). It's very yummy! My favorite thing to dip in chocolate is pineapple! That looks neat. I would love to try it. Love to put fresh fruit, ie strawberries, apples, bananas in chocolate! My favorite thing to dip in chocolate is homemade donuts. I am very traditional and still LOVE to dip strawberries in chocolate! I love cherries dipped in chocolate! So good! This looks awesome! I love Fondue and having fondue parties! Looks awesome Nikki! Thanks for an awesome giveaway! er... awkwardly used "awesome" twice. My bad. my fave would have to be frozen raspberries....they are so yummy!!! Oooh I haven't had a fondue in ages! mmm...sounds and looks delish! Would love to have one of these! Vanilla wafers. They are a simple cookie and won't overpower the chocolate. I like strawberries and bananas dipped in chocolate. What a great giveaway. Thanks. Anything and everything, but if I had to pick just one it'd be brownies! My favorite things to dip in chocolate are Strawberries and Bananas!! My favorite thing to dip in chocolate is toasted pound cake. Thanks! I like to dip peanut butter pretzels in chocolate! This looks like a fun new product! LOVE the easy clean up and the chocolate looks DELISH!!!! My favorite thing to dip in chocolate is graham crackers. Thank you Nikki for the chance of winning a Velata ! looks delicious - thanks for the giveaway! a little bit of everything yummy - thanks for the giveaway! Love chocolate fondue! Favorite to dip: any fresh fruit! Would love to try Velata!! Sounds like a great thing to celebrate my 26 th anniversary on August 19... Hope, hope, hope! I love to dip strawberries. I love to dip cream wafers and cheesecake in chocolate! I love to dip marshmallows in chocolate!! What a fantastic invention, especially great when you have fondue loving kids in the house - much safer for them. My favorite is a toss up between strawberries and pretzels! I have never tried fondue, but it sounds like loads of fun! I think my favorite thing to dip might be pretzels.....love sweet and salty together! Um other than my finger?! Haha I'll have to go with strawberries. Strawberries are my favorite thing to dip in chocolate. Thanks for the giveaway. I love this, and could really use it for my upcoming baby shower! All I can say is that my baby girl is already craving large amounts of chocolate! My favorite is dipping marshmallows in chocolate and then coating them with something salty and crunchy. Would love to win this :) Thanks! This fondue pot is great! I would love to have it! My mouth is watering! I forgot to answer the question! I love anything dipped in chocolate! This looks so yummy! Would love to try it at my next women's small group meeting! I am sure it will be a hit! Fondue is so much fun...and dessert fondue...the BEST! YUM!!! Thanks for the great giveaway! Sorry...favorite thing to dip....brownie bites!! I think the ultimate chocolate combo is with peanut butter...or other chocolate! Fave thing to dip in chocolate is strawberries...hands down! I love to dip strawberries and bananas in melted chocolate! I have Never even seen this product, but I LOVE IT! Yum, I love fondue. I like to dip pretzels in chocolate. Nothing beats the sweet and salty combo! This would be great for entertaining...and for Christmas gifts for Mom and sisters! I love little cheesecake bites dipped in chocolate, so delicious! LOVE that you told us about this product!! I love fondue, but not the hassle of the traditional set-up. I can't wait to get one or two of these!! Thanks for reviewing it and the chance to win! Oops, I forgot to answer the question!! I love to dip pretzels in chocolate, but I love it even more when it's white chocolate! My favorite thing to dip into chocolate would have to be any type of fresh fruit I can get my hands on. I love strawberries in chocolate! Lets be honest I love anything dipped in chocolate :) fondue chocolate is the best. I LOVE fondue but always make the same kind. Now I want to try this caramel one! I LOVE fondue. This warmer looks so cool, too. I love to dip pound cake in chocolate. Mmmmm. Wow! So fun! This would be a great thing to have. Thanks! This is so cool! My family loves all kinds of fondue too! I think I have to have this! My favorite thing to dip in chocolate is strawberries and bananas. My favorite thing to dip in chocolate is pineapple. Yummy! i love love love chocolate. The best thing to dip into it is fruit, especially strawberries and raspberries. 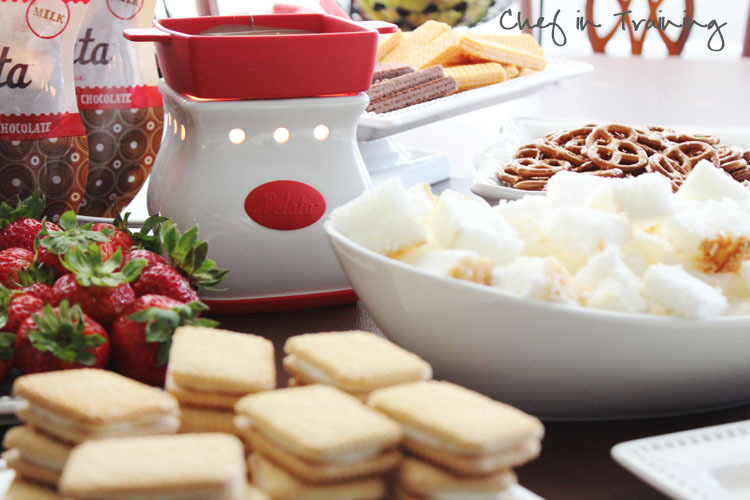 I would love to have this Velata warmer for a cozy and fun party. My favorite thing to dip is bananas in caramel - yum! I have to agree with many of the other comments that the best thing to dip in chocolate is fruit, preferred fruit is cuties. I love fondue! I love to dip pretzels that have peanut butter on them. I also love to dip marshmallows and bananas and apples, potato chips.....there are so many options!! What a great idea for a warmer. I love fondue! It was always a special treat when my Momwould serve it for New Years Eve! Brownie are great dipped in chocolate! Salty potato chips are the best!! I love dipping marshmallows and strawberries in chocolate! Mmmmm I so WANT to win this! Yum! Whoops, forgot to tell you my favorite thing - besides my fingers FRUIT like strawberries! I dip teddy grahams. Yum! I love to dip bananas in chocolate! I love strawberries and cinnamon bears dipped in chocolate. So good! Ooh.. and macaroons! I love all of your recipes!! And thank you for the chance to win the Velata warmer!! Yum! I love chocolate covered pretzels! Fondue is so awesome and so fun! I love strawberries in chocolate but just about anything dipped in Chocolate is so so good! I've never heard of Velata warmers but after reading about them on your blog - I gotta have one!! Have you ever tried creampuffs? They are espically delicous when they just defrost and are still really cold in the middle mixed with the warm chocolate is absolutely amazing. YOU MUST TRY IT!! I love dipping pretzels in chocolate! I totally want one! I just picked up a mini fondue pot at Goodwill, and the ideas are flowing. Would love to try the Velata warmer! Thanks for the chance to win one. POUND CAKE in chocolate is my fave!!! I love strawberries, pretzels, and cheesecake dipped in chocolate! YUM!!! Yum! Only had fondue once if I remember correctly, but soooo yummy! I would love one of these! Lord knows I have enough kitchen gadgets already, but that's what makes life and cooking so fun! Most of my students are not familiar with the many fruits that we take for granted. I have melted chocolate (white and chocolate) in a microwave for special events, birthdays and school parties. They absolutely love to dip bread, fruit, cake and cookies in chocolate. They love my fondue maker and will eat almost any vegetables that can be dipped in cheese. I would love to add this to my classroom for special occasions!! My students would thank you also! This is such a cute item and there are so many possibilities! I know I would put this to good use! OOOPs for got to add the chocolate dipping item.... I love fruit in chocolate but pound cake is good too! This is so adorable........it reminds me of the scentsy warmers but for chocolate.........how does it get better than that???? My favorite thing to dip in chocolate are pretzels! YUM! We are actually setting up a girls' night at the Melting Pot this would be so much cheaper!